If you are thinking about purchasing furnaces Vancouver you will surely be interested in the following interview. Now let’s turn our attention to more traditional forced-air furnaces out at the temperature systems training center where Larry Hacker explains the advances in the industry and what factors consumers should consider when replacing their heating and cooling systems. Larry, it seems like only yesterday we were in your training facility talking about 70 and 80% efficient furnaces and how 90% was the top of the line. Really, that’s all changed of late. Oh Yeah, now 92% really is the bottom of the line, all the way up through 98.5% AFUE. In this segment, what we want to do is speak to the consumer who needs to replace their furnace. What are the different options out there, what are the attributes of each model that we should be considering and what are the different cost savings associated with each of these? On the gas side, the cost savings is pretty high all the way across the board. Now, 92% AFUE is typically the minimum today, all the way up through 98.5. What that means to the consumer, is for every dollar of gas purchased, 92 to 98.5 cents of every dollar is going to heat your home versus being wasted out through the chimney in the older furnaces, or going out through the vent pipings that we use today. That’s good news for us as a society and us as homeowners, that with 92 and above, we’re getting pretty good efficiency and it’s costing us less to heat our homes. Exactly. On the gas side, it costs us less. The thing to key in today though, is how do we also save electrically. That’s one of the things will look at through the three different models. This uses a standard AC drive blower motor. Works great, consumes a higher level of electricity. Kind of like an incandescent bulb versus a fluorescent. This would be like an incandescent bulb all the way up as we go to the different models, to a fluorescent, where we save electrically in addition to getting great heating value. How much electricity in dollar terms are we talking about with a system like this? You’re looking at typically on a furnace to be a $350 to $500 a year to run for electrical to be able to move the air flow through that furnace to heat your home. Wow! That’s a lot. So, if we step up to this one, what efficiency is this? This moves up on the gas side, up to a 95 to a 96 AFUE. What that means, is we’re up to a 95, 96 cents of every dollar heating your home. Plus, we went in and put in ECM motors which are like a fluorescent bulb, however it’s DC drive so it’s much more efficient electrically to move that same air flow. Two things, first of all, I assume this costs a little bit more up front? Yeah. Ten to 20% more to be able to get into this style of furnace. But with that ECM motor, how much are we realizing in savings on an annual basis? Versus looking at something that $350 to $500, you’re going to be somewhere between $50 to $75 a year electrically. That is a huge savings. Now, that’s something that a consumer should really take into consideration because this might cost a little bit more up front, but if you’re saving $300, $400 a year, it doesn’t take long to pay that back. So, that’s an ongoing savings. Ongoing savings and great return on investment. What about this? Is this the top of the line? Yeah, this would be the top of the line. You’d be able to hit 98.5 AFUE, so 98.5 cents of every dollar goes in to heat your home gas side. Then electrically, it utilizes the DC drive motors. The nice part about this is it actually self-regulates to the load of the home. So, it’s going to modulate the gas side from 40% all the way up to 100%. As the outdoor temperature drops, it’s going to ramp up in heating output to be able to heat your home. If we’re talking about modulating – we’re talking about single stage, two stage – it seems to me, the difference between these three models isn’t so much in the gas savings, it’s the electrical savings. What we’re ultimately paying for is comfort. Exactly. When you move up to this, you’re getting a much more comfortable home, plus you’re going to be getting the health benefits of being able to have the fan run longer to filter the air more, all the way through the operational time of the unit. That makes sense because whether it’s an old house or a new house, but especially a new house, they’re built so tightly nowadays, you want to keep circulating the air, you want to keep cleaning it. When we talk about cleaning it, it leads me to add-ons. We don’t have time to cover all the different add-ons, so you want to lean on your heating professional about that. I guess in the best case scenario, if I’m understanding you correctly, this should never turn off once you start it up in the fall. In an ideal world, that would be it. This would start up, it would match the output to exactly what the load is of the home. A huge benefit when that occurs, is we have constant air filtration to go along with it, which is a super advantage with those. Quickly, on the A coil up herein the plenum, great view. A lot of people don’t realize this is where the air conditioning takes place. If I’m considering replacing my furnace, is it a good time to consider replacing my air conditioning as well? It’s a great time because that way you’ve got the heating contractor in your home and they can take care of the cooling system the same time they’re doing the heating, which is really in the end result is going to save the homeowner a lot of money. What about efficiency as it nears the end of a life expectancy? How long does a furnace typically last? 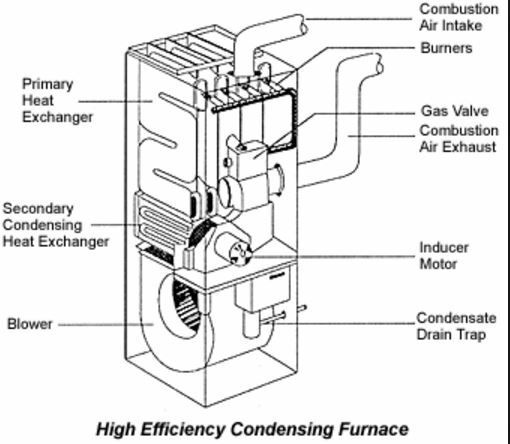 Furnaces in our climate are generally lasting between 18 to 22 years. The cooling side is generally 17, which is surprising. We don’t run them as often, but they don’t last as long. As they near the end of it, does the efficiency go down? Yeah. As soon as you really put anything in, you’re going to start seeing declining efficiency because things do start to get dirty. Even though we have great air filtration, we’re going to see dust and dirt collecting on the coils and that comes back to doing proper maintenance. The longer you run the system, the dirtier it gets and the less efficiency you’re going to get out of it. No substitute for professional maintenance, that’s for sure. Now, I’m a homeowner, I’ve done my research, I’ve got four estimates, they’re all over the board. Do you have any advice on selecting the right contractor for my situation? Yeah. Of those four estimates, the things that I would look at are, which one came out and did a full load calculation? Which one cared about your specific needs? Were there areas of the home that didn’t heat or cool properly? Did they ask you about did you any efficiency or energy upgrades since? More insulation in the attic? New windows? More siding? All of those things tie back to what is really needed for the proper system for your home. So, when you lay those four out in front of you, who did those things for you? They need to care about your ultimate needs in the end, more than just giving you a furnace price. Yeah, it’s important to be an educated consumer, but it seems to me your gut will tell you too, who did all this, who cares about my situation. As we’ve said time and time again, those who shop by price don’t always get the best value, but those who shop by value always get the best price. It’s been great walking through this. I wish we had more time because heating and cooling is such an important aspect of our homes. The one thing I’m taking away from this is as a consumer, if you spend a little more now and upfront, you can reap some huge benefits down the road. Thanks a lot for coming on and walking us through these choices.